There’s something about playing the King. I guess most young actors, certainly in the UK, dream of playing the great Shakespearian monarchs. I certainly did, after getting inspired by Ian MacKellen’s MacBeth. 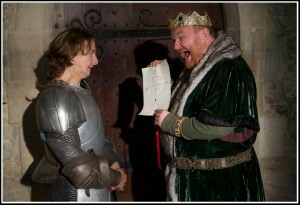 But in the real world my actual experiences of being cast as a king turned out rather differently. 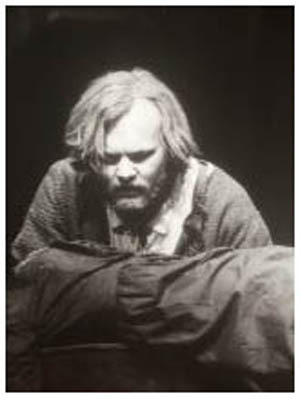 As a student I got to play King Lear (in Edward Bond’s ultraviolent modern version). Going through Lear’s wheel of fortune from absolute tyrant to fugitive to insane prisoner to blind pacifist revolutionary night after night certainly takes it out of you. Lear seldom keeps quiet for long and never stops complaining. It certainly gave my vocal muscles plenty of exercise and perhaps it gave me an insight that having absolute, unchallenged power is a completely unnatural way of life. Later on I got to play Henry II in Anouilh’s Beckett, where he’s struggling to keep up with his intellectually superior and troublesome friend, and in The Lion in Winter, where the same king, now older, is a quick witted arch manipulator doing everything in his power to safeguard his legacy. Henry the man has a fun loving streak that makes him sympathetic, but inhabiting a kill-or-be-killed world he becomes an arch defender of his throne, even to the extent of turning on his own sons. There was even a cameo as The King of Kings, God Himself, opening the passion play in Anthony Minghella’s Two Planks and a Passion. Funnily enough, for the first couple of rehearsals it fell a little flat until we found that playing the actor who plays the character in the play-within-a-play gave the role a whole new dimension and brought it to life. Another lesson there: an onstage God needs some imperfections to be interesting. Now playing these guys teaches an actor a lot about presence, how to carry yourself authoritatively, using majesty and grace while reserving the right to crank up the power of your office to the maximum whenever someone makes the mistake of getting in your way. 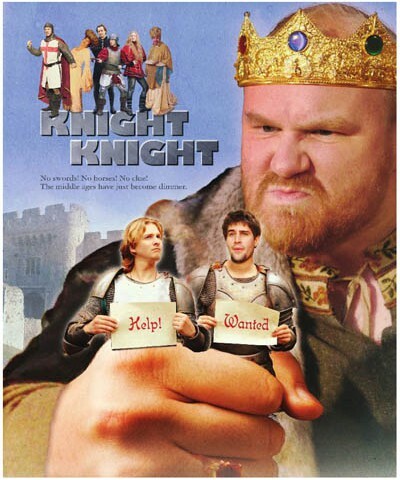 And then there was King Vincent in Knight Knight. The shoot for Christine Boucher’s independent film Knight Knight took place over a week in a historic castle in Kent. The setting was suitably majestic, the crew were hard working and enthusiastic, the time pressure was on at all times. But Vincent was a complete joke of a king. A crass, incompetent imbecile child in a man’s body, his total unsuitability for the role (and his blithely continuing regardless) was a big part of the comedy in Nick Horwood’s script. Basically, he was to monarchy what Inspector Clouseau is to high level police investigation. He was a lot of fun to play. I particularly enjoyed the scenes where the guard warns him about the giant spider in his privy and Vincent simulates torture on him using a rolled up picture of a naked woman. When you’re the guy with the crown on your head you really can get away with all kinds of stuff. While many actors who are very concerned with how they look on camera, worrying that if they play a character with flaws or unlikeable, ridiculous qualities, that this reflects badly on them. Personally, I’ve always thought that acting gives you great opportunities to do things and be things you wouldn’t dream of doing in real life. I wouldn’t want to be as much of a crass, self-centred pig as Vincent in the real world for as much as a second. But it was certainly a lot of fun to give free rein to that side of me in the movie!